SAN FRANCISCO, CA – Dare to step into the “Parallel Dimension” described in the highly volatile notes of the “Cahier de Tavail, ”as the program resembling an ancient book with leather covers is called, because the spectacle you are about to witness in KURIOS Cabinet of Curiosities, the 30th show of CIRQUE DU SOLEIL, is beyond words. 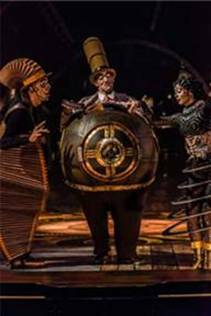 Using the concepts of GUY LALIBERTÉ and JEAN FRANÇOIS BOUCHARD and Written and Directed by MICHEL LAPRISE, “KURIOS” is a mixture of high technology, talent and an overabundance of imagination. A delight to the eyes, with its creative costumes and strange-looking objects, impossible to describe in words. As we watch them we wonder, What are they for? There is a gadget on the ring that resembles a megaphone, but instead of standing on a record player, it is mounted over an old-fashioned photo camera. It is described as a part of "The Portable Orchestra". Another object nearby, looks like an upside down spider with blowing-air pipes instead of legs. Each one of them bouncing a ball on the air. This one is described as "A Dream Acceleration Vacuum." And there is the “Chairman,” an arm chair made of a silver-color metal. Standing on the center of its back, we see a Crystal dome over an egg-shaped light bulb, placed inside a cup-shaped metal cage. The program warns us that it needs more resistance for re-entry. This chair can transport us to the realm of our imagination. We arrive there simply by crossing the narrow suspension bridge over the ring, stretched from the back to the front of the stage. The bridge is described in the program as a “A magnetic portal to an invisible world”. Maybe the world of the impossible, or a world where dreams: collective dreams, mad dreams, or magnificent dreams, are waiting to be rescued and brought into the now. As we look around, in the other side, we find ourselves surrounded by strange-looking people. We can tell, by looking at them, that the “parallel dimension” is not on this earth. But we had crossed the bridge so, our journey begins. Since we don’t know our way, we are given “companions” to guide us. On opening night, our companions were: “The Seeker” (ANTON VALEN) who wearing a white coat over his clothes, looks like a medical doctor. He is described in the program as a humanist, who with his childlike innocence believes in an invisible world where the craziest ideas and the grandest dreams lie waiting. He is convinced that in his larger-than life Kurio Cabinet, is that hidden world where the craziest ideas and the grandest dreams lie waiting to be discovered. Another companion in our journey is Mr. Microcosmos (KARL L’ECUYER) pictured left, who happens to be a Man-Machine and a dream machine. He wears a high hat as tp show to the world that he is the leader of the group, an authoritative figure, the embodiment of the technological progress. Because of his believes, he is as sturdy as an steam train, which in his case, is the shape of his round protruding metallic belly has. He goes to his stomach when he needs a new train of thought because it is there where Mini Lili (ANTANINA SATSURA) a pixie three feet tall actress, lives. She is a beautiful girl, well dressed, with her hair perfectly coif and who speaks a language that we cannot understand. Mini represents Mr. Microcosmos’ unconscious mind, his intuitive self, and his fragile and poetic side. Our third companion is NICO (NICOLAS BAIXAS) Standing on the right of Mr. Microcosmos, in the photo. His name is short for “on the nick of time." He always appears confused, or out of place. He is “The Accordion Man” and the perfect handyman. A little shy, a tad awkward and extremely sensitive. His accordion costume allows him to bend down and stand up so he can be at eye level with everyone. And on the left of Mr. Microcosmos in the photo, is Klara. (EKATERINA PIROGOVSKAYA) Because she is half woman/half antenna she can receive alpha waves by turning on her heels and pointing her hoop skirt in various directions. It is believed that she can also receive messages from another worlds. She has a language of her own and symbolizes our obsession with telecommunications during the golden age, when the telegraph and gramophone were invented. Not pictured, are two more beings. The two quirky robots built by the “Seeker, with metal leather and imagination, who look like giant insects. Entering the “Parallel dimension” allows us to see all the acts. The Chaos Synchro l900, the Aerial Bicycle, The Rola Bola, to name a few. Each one of them in their technique “out of this world” and in their presentation, demonstrating that each one of the artists in KURIOS, is a star. 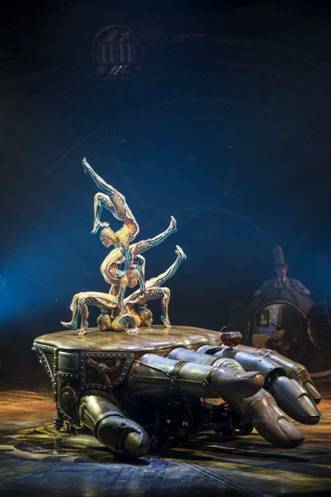 In Contortion, for instance, which is performed over a huge metal hand with moving fingers, four deep-sea creatures that embody electric eels living inside the “Seeker’s cabinet, come to life in the shape of the most flexible female acrobats we had ever seen. In their fluid contortion act they execute a series of incredible human pyramids. Their backs curling to the point where they can place both their feet flat over their shoulders. Moving at a fast pace, they go on contorting their bodies into seemingly unbelievable shapes as if their bodies were made out of rubber. Defying gravity, is “The Upside Down World” This act that starts with a group of people sitting around a table eating dinner. As they eat, they are stunned by the telekinetic powers of one of their companions who can make a chandelier, suspended over their table, move. Another guest, challenges him by wanting to reach the chandelier. As he does, and all look up, they realize that there is another exact table with the exact number of guests right above them but that the other table and the people sitting around it are suspended on the roof, upsidedown. So they become aware that they have "a double", existing in the "Parallel Universe." The tension in the scene is generated when the acrobat on the ground, (ANDRII BONDARENKO) places chairs one on top of the other to build a tower, and does a series of feats in a chair-balancing act, which includes balancing his body parallel to the floor on one hand. He then places a small board over a tower made out of round logs, and swaying his body back and forth stands on top of the logs and executes a series of feats to compete with their other selves (the people sitting upsidedown) through feats of ingenuity. 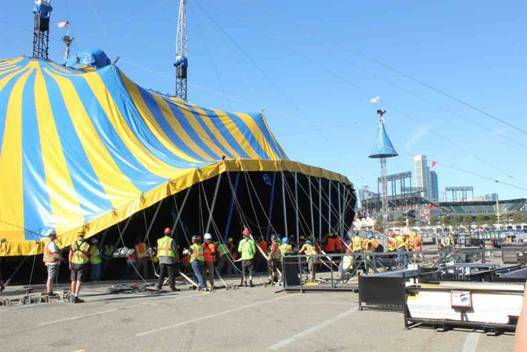 Through two hours, the CIRQUE acts keep moving, each act as daring or more daring than a previous one. In between, the acts, a train, goes around the ring, in "Acro Net" a boat floats over a vast ocean while underwater creatures pirouette and rebound on a net covering the stage, and in “Siamese Twins” the twins hang on the air as they fly high above our heads. There is enough talent in KURIOS to keep the audience entertained all night. And in a moment imbued with simplicity and poetry at the end, and artist (NICOLAS BAIXAS) uses his fingers to tell a story that is projected on the surface of the moon. The sight is unique. out of this world, a touch of genius.